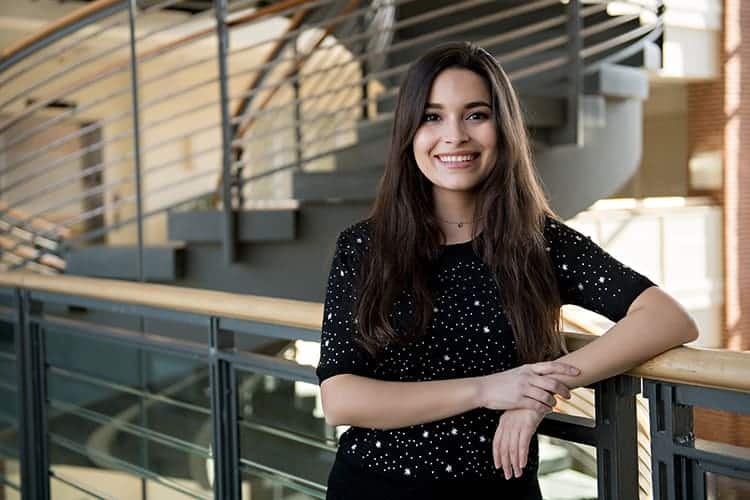 From Brainstorm to Billboard Majo Bustamante '18 was a marketing and communications intern for NASA Automotriz, the company that owns the rights to sell Ford and Volkswagen in San Jose, Costa Rica. This past summer I had the opportunity to intern with NASA Automotriz, the company that owns the rights to sell Ford and Volkswagen in San Jose, Costa Rica. The experience was possible thanks to the Charles S. and Lee P. Rowe scholarship fund and the journalism department’s support. I was the marketing and communications intern, and my main objective was to help launch the company’s new loyalty programs, Ford Nation and Volkswagen Life, as well as their VIP clients’ rewards club. The opportunity allowed me to work in close contact with the marketing manager and the other marketing executives at the company, which gave me insight as to what an average day looks like in this field. I attended marketing meetings with my boss that included a sales pitch for software to automatize social media responses and a budgeting meeting for airing a commercial in one of the main national channels. Additionally, I was able to attend almost all meetings with the businesses with which we were trying to establish partnerships, and to help negotiate the benefits and arrangements. When I arrived, my boss explained that the agency’s goal is to be the first vehicles company in the country to offer their clients a loyalty program as well as a VIP rewards club. He showed me the sample cards that would be sent in a leather pouch to clients to inform them about the discounts they would be able to enjoy just by showing their car keys at different establishments. The brand needed help creating connections with sports centers, restaurants, hotels, dentists and spas in order to secure the partnerships. The marketing department had also started organizing special experiences that could be offered to influential brand ambassadors in order to recognize and reward their loyalty to the brand. The experiences could include VIP tickets to their favorite concerts, personalized dinners, wine tastings and test tracks of new vehicles with other brand ambassadors. The company also needed to work with the sales department to build a database of those clients that had brought in new customers as a result of their recommendations. The ambitious project was innovative and highly marketable. I enjoyed the creative component of this marketing internship, as well as the amount of freedom my co-workers gave me during our contract meetings. One of my tasks included studying the proposed mutually beneficial relationship with other businesses and overseeing the legal contracts that would make it a reality. I would then debrief the other marketing executive and attend the meeting with the potential partner to discuss the discounts and advertising events moving forward. The first thing that I was told was to not be afraid to speak up, as my boss wanted me to help negotiate the agreements. Having interned with the Costa Rican Embassy at the United Nations Office in Vienna, Austria the summer before, I never thought that the persuasion skills that I learned overseas would prove useful in this new area. Marketing meetings were similar, in a way, to delegates negotiating proposals, and this made me realize why the United States sometimes focuses more on skill sets than fixed values. The experience gave me confidence to approach new challenges with a positive attitude, and to recognize familiar patterns in unknown situations. It was exciting to be involved in a project with such a clear and definite end goal, and to see the final result being advertised on billboards and social media. This internship certainly influenced my post-graduation plans and I’m thankful to the university for all the wonderful opportunities it has helped me secure. The Strategic Communications major at W&L is quite interdisciplinary, which allows you to tailor it to your own interests. I was surprised to see that graduates from this major could work in fields as diverse as International Relations and Marketing. I was attracted to this versatility. Brunch at Bistro and the House Special at Don Tequila. What three books do you recommend to everyone? I loved taking Professor Timothy Gaylard course, Music in Stanley Kubrick Films, during Spring Term. I have always admired Kubrick’s work and I just cannot believe I got to spend four weeks analyzing his movies. Not necessarily an event, but Spring Term is definitely my favorite time at W&L. I’m still sad that I will graduate before I get a chance to take Children’s Literature or Cross Cultural Documentary Filmmaking. I used to play competitive chess when I was younger.